Are you tired of driving that same old car through the streets of Doral, Kendall, Hialeah, and Miami? If so, it might be time for an upgrade. If you’re looking for a new sedan, you certainly have a lot of options at your disposal, as sedans are one of the most diverse classes of car on the market today. 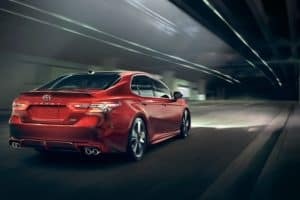 Through all the competition, however, the new 2019 Toyota Camry tends to stand out. Whether you value reliable performance or a spacious interior, the Camry might just be the vehicle you’ve been looking for in the South Florida area. Find out whether or not it’s right for you in our comprehensive 2019 Toyota Camry review. There are two engine options available with the new Camry, and you’ll be impressed no matter which one you opt for. The standard engine is an efficient 2.5L 4-cylinder engine that boasts 203 horsepower with 184 lb-ft of torque. If that’s not enough power for you, however, you can outfit your Camry with the 3.5L V6 engine. With that masterpiece of engineering, you can enjoy 301 horsepower and 267 lb-ft of torque. In addition to the engine options, you also have options when it comes to your drive mode. The Camry can be optimized however you see fit by switching between Normal, Sport, and Eco settings. The normal mode grants you an average balance of performance and efficiency, while Sport mode emphasizes performance at the cost of efficiency, and Eco mode emphasizes the opposite. You can switch modes with the simple press of a button, so don’t ever think you’re locked into just one. Inside the Camry, you’ll find a luxurious interior with more space than you might think. Up front, you’ll have 38.3 inches of headroom and an impressive 42.1 inches of legroom. Your rear passengers can enjoy generous space as well, with headroom and legroom each coming in at 38 inches, so even your tall companions can rest comfortably in the second row. The design of the Camry itself was crafted to be driver-focused. The cabin is wide and open, yet all the controls feel as if they’re faced toward you when you’re behind the wheel. You don’t even have to reach far, either, as the Camry includes steering wheel controls. Everything you’ll ever need is right at your fingertips. 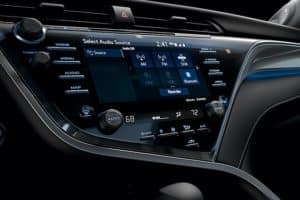 No new sedan would be complete without some of the latest technology, and that’s exactly what you’ll find inside the 2019 Toyota Camry. The 8-inch multimedia touchscreen grants you access to the new Entune™ 3.0 infotainment system. It comes complete with a comprehensive app suite, where you can find apps for virtually anything you need. Apple CarPlay™ is also implemented, so you can connect your smartphone to your vehicle and access your favorite apps from there. Behind the steering wheel, you’ll find the available 7-inch, color multi-information display. With this handy screen, you can get safety alerts and turn-by-turn directions that you can see without having to take your eyes off the road. For an even more immersive display, however, make sure you opt for the 10-inch Head-Up Display that projects important information directly onto your windshield so that it’s within your line of sight but never in the way. 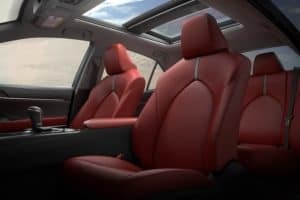 This is just a taste of what the 2019 Toyota Camry can offer you. To learn more, you’ll have to find a reputable Toyota dealer in the Doral, Hialeah, Kendall, and Miami areas. That’s where Doral Toyota is happy to help. Stop by our dealership so that our team can help you figure out whether or not the Camry is right for you in South Florida. Schedule your test drive today!